The new non-native invasive in town, garlic mustard, smells and tastes like garlic. It has clusters of small white flowers with four petals. The leaves are triangular or kidney-shaped with large teeth. A new invasive plant has arrived in Westborough. Called garlic mustard (Alliaria petiolata), it smells and tastes like garlic and belongs to the mustard family. 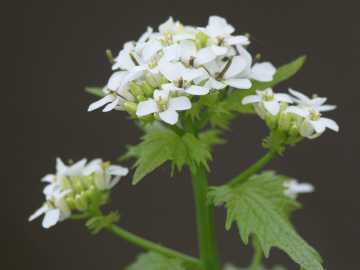 This plant blooms mainly in May and June in clusters of tiny four-petal white flowers – not yellow like many mustards. Its leaves are triangular or kidney-shaped with teeth that are large enough to notice easily. It's worthwhile learning to recognize this non-native invasive. That way, we can pull up the plants while they're still few in number and prevent them from becoming established. With some effort, it might be possible to keep garlic mustard out of your yard or property, or off particular parcels of open space land. If you think a plant might be garlic mustard, just crush a leaf and give it a sniff. While you're pulling up garlic mustard, consider eating the plant. With its garlicky flavor and aroma, it's a reasonable addition to salads, soups, and stews, according to some experts, including those at the New England Wild Flower Society. It can also make a fine ingredient in pesto. If you decide to try it, remember to wash it first, and avoid using leaves from areas with pollution or pesticides in use. Garlic mustard was probably brought to this country as a kitchen herb. The first record of it here was in 1868 in Long Island, but it may actually have arrived earlier. It came from Europe, where it has long been used as a flavoring for meat, fish, and sauces. The plant lives for two years – it's a biennial – and looks different each year. In its first year, it exists as a rosette, a circular cluster of leaves that lie close to the ground. The rosette often stays green through the winter and gets an early start in the next growing season. In its second year, when it has gained the strength to bloom, the plant grows 1-1/2 to 3 feet tall, with kidney-shaped leaves near the base of the plant and triangular leaves up on the stem. As new flowers open, old ones lower on the stem ripen into seed pods 1 - 2 inches long. They're held upright, like the seed pods on many mustards. The plant then dies around the end of June. Garlic mustard is a versatile plant. You can find it in full sun or along the shady edges of woods and trails. For example, it grows at Gibbons School in the sunny open area near the fenced retention pond at the right side of the building. You can also find it at the shady edge of the dirt parking lot at Bowman Conservation Area, on the side near the stream. The plant is newly arrived there and stands taller than the yellow-flowering celandine, common blue violet leaves, ferns, and a host of still-small jewelweed plants. But why worry about another weed? After all, we already have plenty of them. The problem with a non-native invasive plant such as garlic mustard is that it can do more than just grow where we might not want it. It can take over an area, shading out and crowding out native plants. In the process, it deprives native wildlife of plants they use for food and shelter. Think of the forest floor at this time of year in the Bowman Conservation Area. It's carpeted in some places with fragrant, flowering wild lily-of-the-valley (Maianthemum canadense, also called Canada mayflower) and dotted with small white starflowers (Trientalis borealis). You can spot pink lady's-slipper (Cyrpedium acaule) in bloom there. What will the area look like if, or more accurately, when garlic mustard spreads from the parking lot into the nearby woods? Why does garlic mustard grow so profusely and spread so rapidly in North America but not in Europe and Asia? The key reason is that here garlic mustard is free of the competing plants and natural enemies that keep it in check in its own native environments. In Europe, for example, it grows in patches but doesn't take over. At least 30 different insects attack the plant. Not so here. Even our white-tailed deer won't eat it. They don't like the garlicky taste. Scientists are investigating "biological controls" – insects, fungi, or microbes that might be released to control the plant – but so far nothing promising been uncovered. As an invader, garlic mustard has chemical weapons. The plant helps to make room for itself by releasing chemicals into the soil that make it difficult for tree seedlings to grow well. In this way, it harms future generations of native trees such as sugar maple, red maple, and white ash and changes the nature of our forests. How does its chemical weapon work? Most of us aren't aware of it, but a vast, beneficial underground partnership exists between large numbers of native plants and certain native soil fungi. In this partnership between plant roots and fungi, the plants provide sugars that help to nourish the fungi, and the fungi help the plant roots to absorb soil nutrients such as phosphorus. The chemicals from garlic mustard kill fungal spores, preventing young plants and fungi from establishing their partnership. Another reason why garlic mustard spreads so well is that it makes large numbers of long-lasting seeds. It can self-pollinate, so a lone plant in a new area can produce seeds whether others are nearby or not. And when a single plant goes to seed in its second year, it produces thousands of seeds – up to 8,000. These seeds can survive 10-12 years in the soil. For more than a decade after the original plant is gone, new invaders spring up from the "seed bank" left in the soil. For now, while the garlic mustard invasion is just beginning in Westborough, we may have a chance to protect our local landscape by simply pulling up the plants - and perhaps eating them! - as they appear. It's best to do so before the plants go to seed and start to build up a seed bank that will be with us for years to come. We should see what our ongoing collective effort might accomplish.